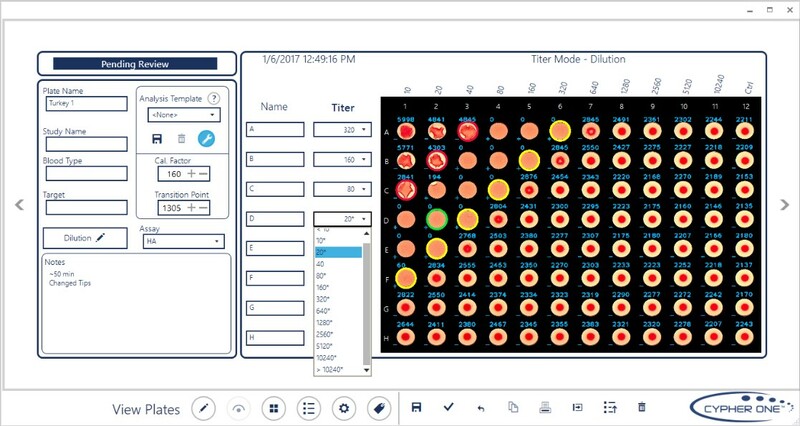 The Cypher One analyzer provides automated imaging and interpretation of hemagglutination and hemagglutination inhibition assays, providing digital experimental records and consistent, non-subjective results. The Cypher One sets a new standard in data integrity for HA and HAI assays. Cypher One is a new tool for rapid automated analysis of hemagglutination (HA) and hemagglutination inhibition (HAI) assays. Until now, HA and HAI assays required trained experts to interpret and manually record the data. The subjective nature of manual interpretation often leads to error within the measurement. 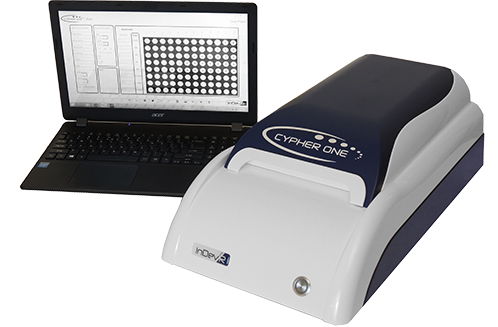 The Cypher One system not only standardizes the analysis but also provides a digital, traceable record to enhance data quality and reliability. Conventional U and V bottom 96-well plates with HA and HAI assays are imaged and analyzed in the instrument, producing a digital record of the images and titer assignments. Users enter relevant experimental information, such as red blood cell type, sample names, and dilution factor and the complete record is maintained in a secure database. Cypher One can easily be integrated within larger information management systems through import and export of CSV files. The software is 21 CFR Part 11-compatible, with features such as user based access, audit trails, and electronic signatures. NEW SOFTWARE UPDATE: The Cypher One software now includes a convenient method to create customizable 96-well plate layouts. See application note. The Cypher One system is compatible with operation in 21 CFR Part 11 and Annex 11 compliant facilities. The Cypher One system provides a user-friendly interface that operates within a Windows 10 operating system. Users can organize batches of plates, enter experimental information, adjust analysis parameters, and view and edit results. A database of records allows previous experiments to be tracked. Q1) Can I use any brand and type of 96-well plate? A1) InDevR has validated the use of several ANSI SLAS standard format U and V bottom 96-well microtiter plates, and the validated plates are listed in CF-0166 Cypher One Plate Compatibility. Alternative plates may be compatible with Cypher One. Plate options can be discussed with InDevR. Q2) Are the HA and HAI assay results limited to specific types of red blood cells (RBC)? A2) InDevR has validated the system’s performance using both Turkey and Guinea Pig RBCs in U bottom and V bottom plates for both HA and HAI assays. Other RBC types, like human, horse, and ferret, can be used in the assays, but the user should validate the accuracy of the titer calls with these RBC’s. Q3) Can I integrate the Cypher One instrument into an automated processing system using robotics or other translation methods? A3) The current Cypher One model does not readily support full automation. The next generation HA/HAI reader from InDevR is designed for high throughput environments utilizing plate handling automation. Users will be informed when the launch date of the next generation reader is confirmed. Q4) Is the instrument limited to HA and HAI? A4) Cypher One was validated for hemagglutination and hemagglutination inhibition assays with influenza virus. 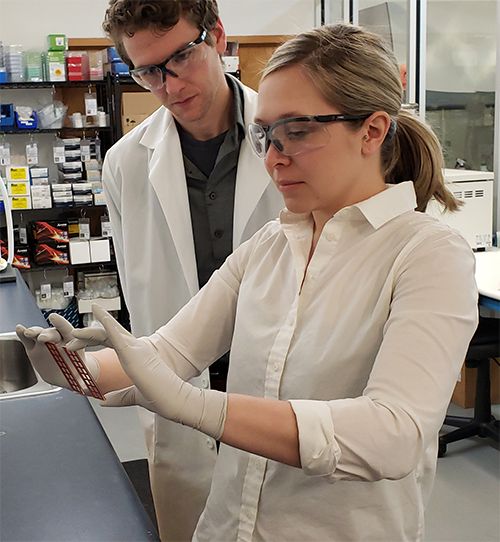 Customers have discussed using Cypher One with other agglutination assays, such as microneutralization, blood cell typing, and mycoplasma gallisepticum detection, but InDevR has not validated the use of Cypher One for these assays. Q5) What is the maximum throughput of the Cypher One system? A5) The complete cycle time from plate loading to plate removal and titer determination is typically 40 seconds per plate. Therefore, a trained user with a stack of assay plates can image and process approximately 90 plates per hour. The Plate List software feature is particularly helpful when processing large numbers of plates because it allows the experimental information associated with each plate to be entered prior to the batch run. Q6) My laboratory uses transparent lids over the 96-well microtiter plates. Can the Cypher One operate with the lids remaining in place? A6) InDevR has verified the performance with both transparent lids and transparent sealing tape placed over the 96-well plate. For their own assurance, each laboratory may want to validate the use of lids, but prior experience has shown that the Cypher One system is fully compatible with transparent lids and sealing tapes. Q7) Does the Cypher One instrument tilt the plates to determine agglutination state? A7) Cypher One images the plates in a horizontal, non-tilted position and uses advanced analysis to determine the agglutinated or non-agglutinated state. CF-0082 Cypher One Application Note #5 Manual Tilt vs. Cypher and CF-0142 Manual vs. Automated Readers for Hemagglutination Assays provide more detailed descriptions of tilted vs. non-tilted plate reading. Q8) Can I use any format of sample and control locations throughout the plate? A8) Plate orientation, dilution direction, sample grouping, and well definitions including location of control(s) back titer, and blank(s) can be defined in the new template setup in just a few easy steps. The template is built within the Cypher One user interface and is graphically displayed as the template is constructed. Q9) Are specific controls required? A9) Titer determinations by Cypher One require a negative control when analyzing samples using the “Simplified Calibration Mode”. This mode will analyze wells containing negative controls and make a direct comparison to establish what the non-agglutinated wells look like. Users may change the calibration mode and utilize an additional parameter to optimize the interpretation algorithm when the plate does not include a negative control. Q10) How extensive is the training in order to be able to operate the Cypher One system? 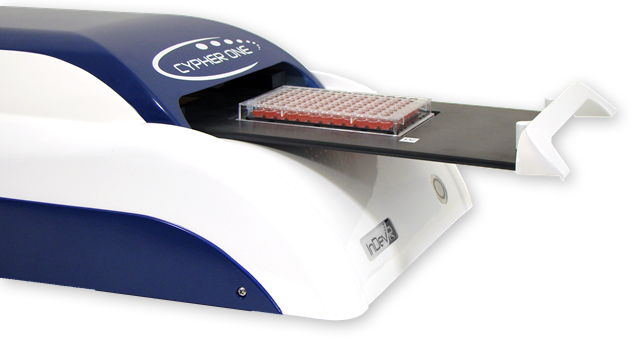 A10) The Cypher One user interface is intuitive and quickly understood by experienced hemagglutination assay operators. Training is accomplished by following the steps in the manual and does not require InDevR personnel on site. Questions can routinely be answered by InDevR personnel over the phone.